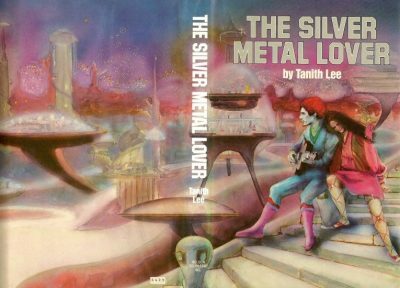 1981’s The Silver Metal Lover is the first volume in Tanith Lee’s Silver Metal Lover duology; in fact, until 2005 it was the only volume in that series. This novel, in which we learn that sixteen-year-old girls are not cold engines of pure logic, reminded me quite a lot of the two Four-BEE novels; like the nameless narrator of those two novels, Jane is a child of privilege. It’s true that a third of the world’s human population died when the Asteroid grazed Earth, but that was before Jane was born. It is also true that many have no hope of employment, but thanks to her mother’s vast fortune this does not seem likely to be relevant to Jane. But there are also quite a few differences between Jane and the unnamed narrator of the Four-BEE novels…. Unlike the unnamed narrator, Jane’s oppressor isn’t a cabal of intelligent machines. It’s her own mother. Mother Demeta does her best to make Jane unattractive (dyeing her hair an unflattering colour, feeding her pills that keep her unfashionably plump) and insecure (constant criticism, framed as loving motherly help). Salvation does not come from other people; Jane’s rich pals are as clueless as she is; some of them are rivals rather than true friends. Help comes from robots. Or rather, one particular robot, the robot minstrel Silver. Silver was designed to look like a very attractive man, as well as given the ability to please his patrons in all possible ways. All possible ways. Immediately, irresistibly smitten, Jane finds it difficult to sustain a connection with Silver. While Silver’s services are available to anyone who can pay, Jane is in fact not one of those people. She may enjoy a life of luxury, but it is one that depends on her mother. Jane’s allowance, the funds she personally controls, may be large by the standards of the rabble, but not by the standards of her class. Jane acts boldly for the first time in her life, trading all that she has for the one thing she desires. But having won Silver for her own, can she be sure that the robot truly loves her in return? And can she keep Electronic Metals from repossessing their missing robot? And if she fails, can she live with her loss? This is one of the few Lee books that does not feature a missing mother1. That is too bad for Jane, because her mother is a real piece of work. Demeta wants Jane to be a domesticated, defeated dependent, a fashion accessory who makes Demeta look better by contrast. One wonders if Demeta chose the name Jane for her daughter because she was intended to be a Plain Jane. Demeta goes to great lengths to keep her daughter powerless and dependent. Jane is taught no work skills. She cannot approach the government for training and job help, because Demeta has assured the state that her daughter has no need to work; mom will provide. In a world where jobs are rare, the state is willing to leave the rich to care for their own. Demeta cuts off Jane’s tiny allowance when Jane leaves home, in a bid to force her daughter to choose between starvation and subjugation. Oddly enough, once Demeta realizes that she cannot bully or blackmail Jane into returning home, she appears to completely lose interest in Jane. One might be tempted to despise Jane for falling prey to a silly infatuation. After all, Silver is simply a robot. His apparent affection for Jane may just be an illusion produced by well-designed software (although I find the increasing desperation of Electronic Metals to recover all of their sophisticated robots suggests that the software was more successful than they had intended). But if the initial impetus for her escape from mom might have been infatuation, Jane discovers that she can take bold action in pursuit of her goals. She is also willing endure some tough sacrifices in order to keep her hard won independence. In that, she is very much like the narrator in the Biting the Sun duology. I am a little baffled to discover that there is a sequel to this. The story seems complete and yet I know, because I own it, that Lee discovered she had something more to say. I am curious to see what it was; alas, that will not be for some months. The Silver Metal Lover is available in US and British editions. 1: Nor is there a missing father in this book. Demeta used an an anonymous sperm donor. The donor is irrelevant to Jane, who has never had a father figure to miss.